This book was a team effort! I was pleased as punch to share my hero's story. I'm also excited to donate a portion of my royalties to help Dolores continue her work. Please visit the Dolores Huerta Foundation's website, to learn more about how you can support Dolores. Want to See My Book? Do you? 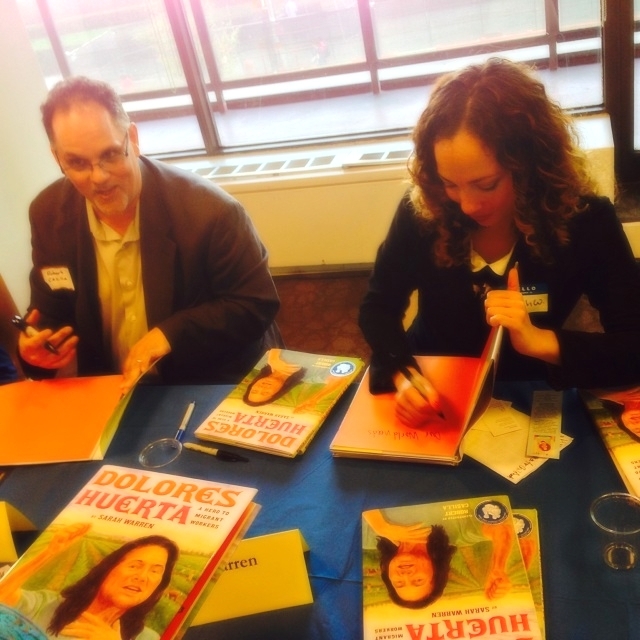 I wrote a book about my hero, Dolores Huerta. I like Dolores because she stands up to bullies. She protects people. Guess how many words are in the story? 660. Guess how long it took me to write it? 10 years! See that guy next to me? That’s Robert Casilla! The illustrator!! I was so excited to meet Robert when we were honored by the Jane Addams Peace Association. I’m grateful for his amazing work on the book! Does your inner bookworm complain that you never take her out anymore? Sounds like you two should visit some independent, local bookstores where you can meet neighbors, relax, touch real books, and discover books you never knew you didn't know about! Try Birchbark Books, Red Balloon, Magers and Quinn, Boneshaker Books and Chapter2Books Your bookworm will thank you forever. These stores also carry my book. Thanks guys! Psst...here's what people have to say about this book. Read a review! Watch this ad. Do you hear the grand, fancy voice talking? That's my dad! I've had a blast writing short stories with a screenplay format for Amazon Rapids, an interactive reading for kids aged 5-12.